In a conscious and considerate gesture shown by the doctors and employees of Ram Manohar Lohia hospital ( RML Hospital), the said doctors and employees have donated their one day’s salary to the Prime Minister Relief Fund for the nepal earthquake victims. The said donation is corresponding to one day’s salary in the month of june and together amounted to Rs 20 Lacks. 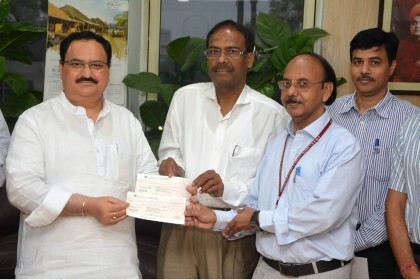 Dr A.K Gadpayle, Medical Superintendent, RML Hospital, handed over the cheque to the hon’ble Minister of Health and Family Welfare, Shri J.P Nadda and other senior officers of the ministry yesterday. The minister appreciated the initiative of the employees for a noble cause.